Welcome to the New and Improved Archives at Bungie.Org! Trying to keep news updates to one per year, I guess. I discovered a couple of days ago that I'd managed to hose EVERY SINGLE BINARY FILE on this server during a move over the summer - there was no effect to the .hqx files (almost all of the files on this server), but the .sit, .bin, and .zip files were all rendered useless by my incompetence. Thank goodness for backups! All should be well again - if you run across a corrupted file, PLEASE - contact me. Also - for those of you creators who don't get out enough - there's another game in town; FileBall. 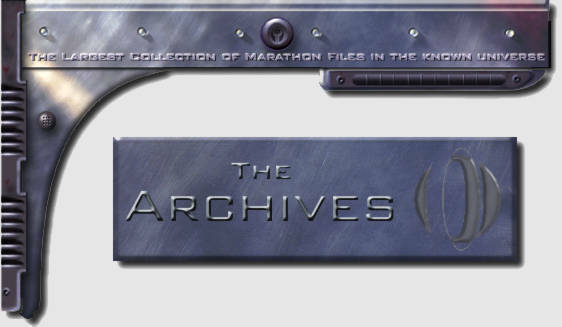 FileBall is a file archive for an ever-growing list of titles, of which Marathon is one. The Lh'owon Ar'kives are a place where you, the creator, gets full control over how your product is presented - you write the description, you provide a thumbnail teaser if you choose - and the FANS, not me, get to decide how good it is. I'm not suggesting you submit files SOLELY to Fileball; I'm suggesting you send them to both places. (If bandwidth is a limitation, and you'd rather not upload two copies, you can simply send me email, telling me to add your FileBall upload here.) We're not really in competition - I manage both places, though I have the backend wizardry of Fm and the vigilant problem-solving help of the BattleCat over at FileBall. This is just an opportunity for creators to have more control over their product, recieve more exposure, and actually see what the gaming public thinks of your work. Check it out! No real news today... I was just in here cleaning up some of the grammar problems I'd left in previous updates (is that better, mom?). I wanted to remind everyone that the Aleph One SDL maps are now available here, as well as on their home site, Electric Infinity. In addition, in the coming days, I'll be adding many (most?) of the Aleph One maps that were previously stored at the Marathon: Open Source page. There have been a bunch of folks who've said that they've had trouble downloading large files from the Archives. Usually, it's over a slow connection... but not always. I've made a major change...most (not all, but most) of the links now point to files on a more robust server (I hope). I have no idea how successful this is... so I need YOUR help. If you've had trouble in the past, please try again. If you're successful where you weren't before... PLEASE WRITE and let me know. Thanks! There hasn't been a news update on this page for 5 months... because mostly, the page is self-explanatory. ;) However, there are two changes today that warrant a note... the date problem is finally fixed (thanks, Joe G., for all your feedback! ), and I've finally gotten around to adding a section for maps based on the latest build of the source code project. (See Marathon: Open Source for the latest news and build.) As always, the latest files can be found at http://archives.bungie.org/newstuff/... so go get 'em! It took a mighty long time... but we're back! Sorry about the delay, and keep an eye out for new files... we'll be adding them all week! In response to much feedback over the past six months, the Archives at Bungie.Org have finally been redesigned, and hopefully will be easier to use. Most options are explained fully, but if you are still having problems, check out the Help page. Now go get some files!